Way back in the day, I used to report the news in a daily newspaper. I learned a lot but moved into other forms of writing when I felt more like an ambulance chaser than a journalist. That was before the web. Today, it’s interesting to watch the newspaper industry on life support trying to figure out how to stay alive. The problem is fundamentally a sales funnel problem: How does a newspaper exchange its information for money? In Lauren Indvik’s May 26th Mashable article, entitled “5 Ways to Monetize the Future of News Media“, she offers us the methods that we are seeing news media experiment with online today: Fully paid, partially paid, metered, free, and advertisement. I gave a similar list of pricing ideas in January, some of which can apply to the news media industry. There is usually a dichotomy between how newspapers distribute content online and how they distribute content offline: Paid offline newspapers shouldn’t give the same content for free online. And, free offline newspapers shouldn’t require payment online for the same content. But that’s what was happening for a while. And it’s more challenging when the same information is available in other sources for free. Newspapers were once the only way to get the news and it was convenient to pay for them to show up on your doorstep in the morning. But between Google News and Twitter, people can stay pretty well informed up-to-the-minute while newspapers lag behind the story by a full day. Once lucrative parts of newspapers (like premium advertising space and classified ads) are being replaced: There isn’t much limit to online adspace and classified ads have been cornered by craigslist and kijiji, which provide cheaper ads and a better reach. Newspapers report on the news. For years, when something happened, the newspaper informed you. That made sense when the newspaper was the only means of carrying the news. And even when televised news expanded to 24-hour news stations, newspapers still had a place. But today, people can get whatever news they want – international, local, niched to their interests – faster and for free. Newspapers cannot compete with that. Instead, I believe that newspapers need to adopt a different approach between online and offline. Online, they can continue to report the daily news, especially with a local focus (and especially if no one else is reporting locally). Local news is valuable. They can make it free (with advertising). But offline, they need a different approach and this is not going to be widely accepted by newspapers because it will change how their staff have to work: Offline, newspapers need to adopt the model used by The Economist. That is, they need to go after the deeper story, the story behind the story, and provide insight, not just information. Offline newspapers have traditionally just told us what’s going on, reporting the news as it happens. This isn’t a surprise because underpaid, overworked journalists have to run from car accidents to quilting bees to report on everything. They don’t have time to find the real story and they don’t have time to dig. They’ve focused on What, Where, When, Who, and How, and they’ve completely neglected Why. Here’s how to make it work: Newspapers need a group of journalists to gather and report on local news in the way they’ve always done it and post it for free online. And, they need a group of investigative journalists doing the digging to find the real story to provide in a paid, printed format. This offline, printed newspaper story needs to dig; it needs to push beyond merely informing readers and actually provide real insight; it needs to even go so far as to advise, forecast, and recommend. Print newspapers can’t just be a mirror anymore. They have to be a guide to living. This change will not be welcome. It will come at a great cost. 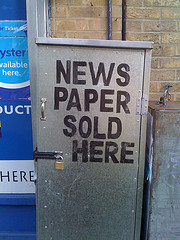 It won’t return newspapers to their heyday. But I believe it’s the only way that local (print) newspapers are going to survive.